This is posted after the date of October 18 – 19, but that is all right. Since the story in the novel, THE DOC, is about Civil War re-enactors who are in trouble with Homeland Security, a Civil War reenactment is the perfect place to garner followers. 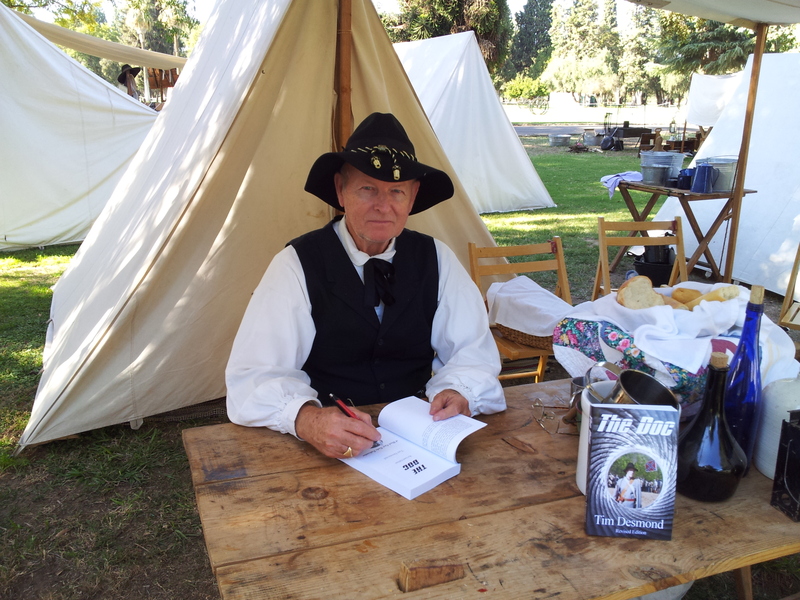 This last of the 2014 reenacting season events in the San Joaquin Valley was at Kearney Park in Fresno County and hosted by American Civil War Association and Fresno Historical Society. It commemorated the 25th year of the annual event. While each year a different battle is depicted, this year being 150 years since the Atlanta Campaign, that was the theme. Of course the Atlanta Campaign brings up all sorts of images of the most talked about events of those months such as General Sherman’s march to the sea, after, of course, the burning of Atlanta, and the mass market success of the novel and movie Gone With The Wind. As there was so much more than all that, visitors to my discussions were shocked to learn of Western Theater, Army of Tennessee, General Joseph Eggleston Johnston, General William Hardee, and often ignored Generals Daniel Govan, Ben Cheatham, and Patrick Cleburne with their success as they battled at the many locations from Ringgold in early May 1864 to Atlanta by July 22. I was going to tell some of them what I learned from my Arkansan friend Bob H., at Shiloh in ‘07, “Get used to it, you’re in the south.” But, I realized I wasn’t really in the south, but in California. I had to settled on saying , “I could go on” and so that’s it for this, I could go on. Thank you Fresno Bee, Fresno Historical Society, American Civil War Association, and Civil War Reenactment Society (CWRS) for continuing the living history event. This last event of the season in our area is always a pleasure to be a part of, with the entire involvement of our fellow re-enactors.